There were times when I never thought I’d see this day. 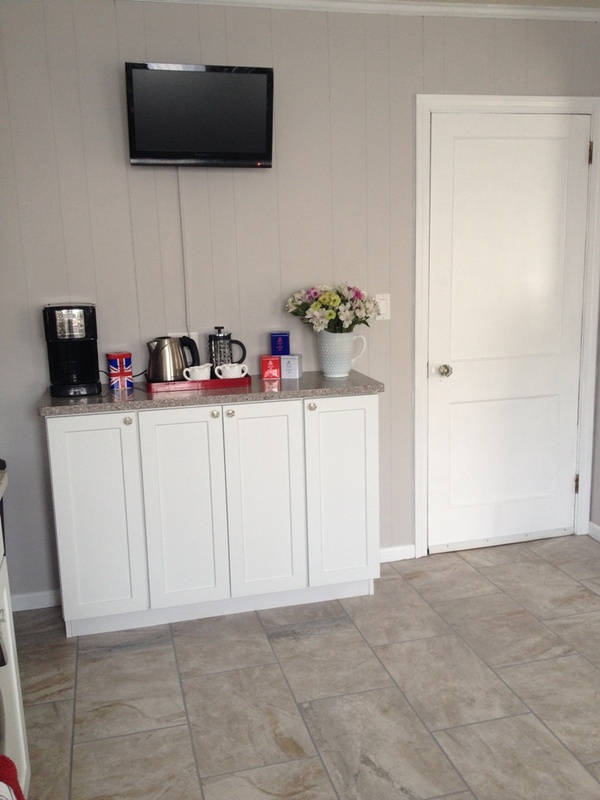 Our kitchen renovation is complete! Jamie and I are totally obsessed with it. We keep catching each other just standing in there staring at our labor of love. It was worth every second of stress, sweat and hard work. So without further ado, I present our new kitchen! Isn’t she gorgeous?! This makes me want to be a good wife and actually cook some meals. Our new stove and dishwasher play beautiful music for us. Sometimes I just turn them on to hear it. Clearly the novelty hasn’t worn off yet. We tried to keep costs down so my handyman hubby did a lot of the work himself. The old ceramic floor was in great condition but it wasn’t really our style. 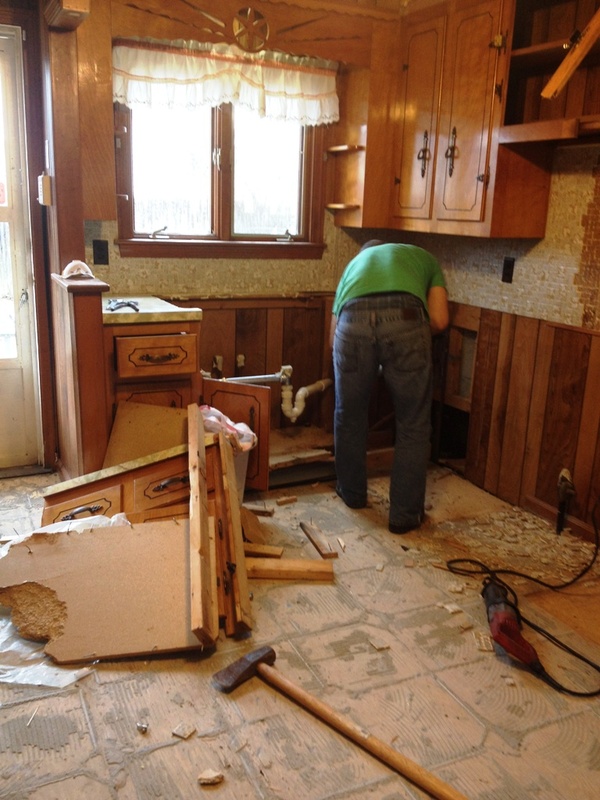 We figured if we were spending all this money on a brand new kitchen, we might as well spring for new floors too. We found this little gem under the subfloor when we were (painstakingly) pulling nails out. 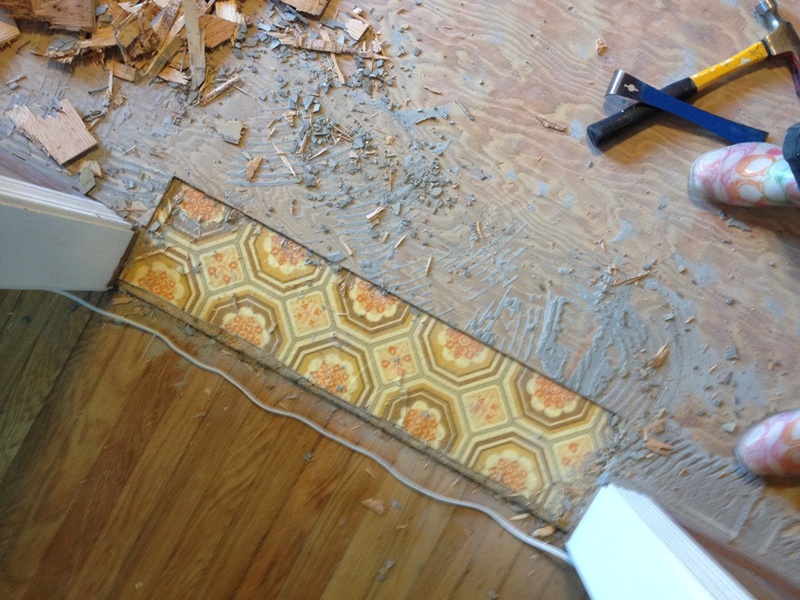 Based on the year the house was built (1925), we are pretty sure that the original hardwoods are under the linoleum. 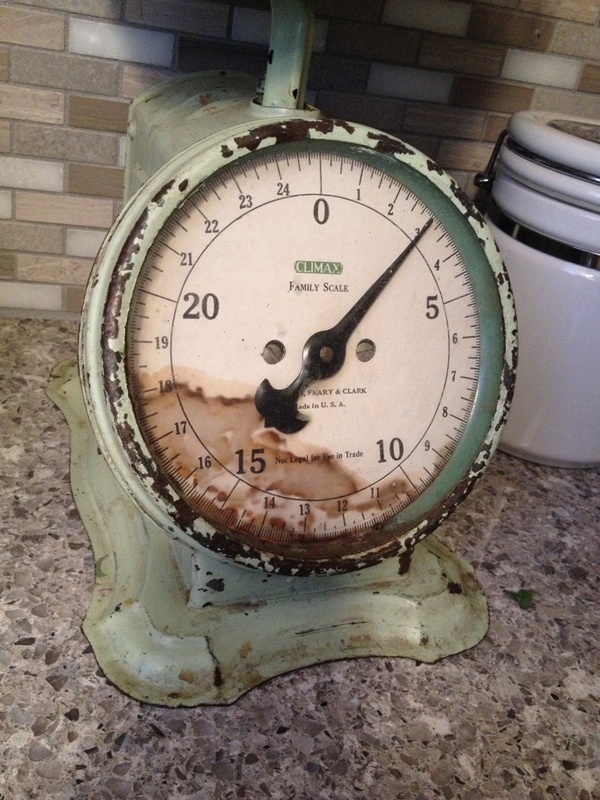 If we’d had more time and patience, I would have loved to have them restored. Unfortunately we were on a time crunch and after the hassle and huge mess taking off one layer of flooring caused, we were all set. Jamie had to grind the thinset off using a diamond disk on an angle grinder. That was in January. When I tell you that I am still getting up dust and dirt from it when I wash the floors, I’m not joking. This is what it looked like halfway through the grinding process. I washed the floors and dusted the house 5 times that weekend. Then swept every day until the next weekend when I washed the floors 4 more times. 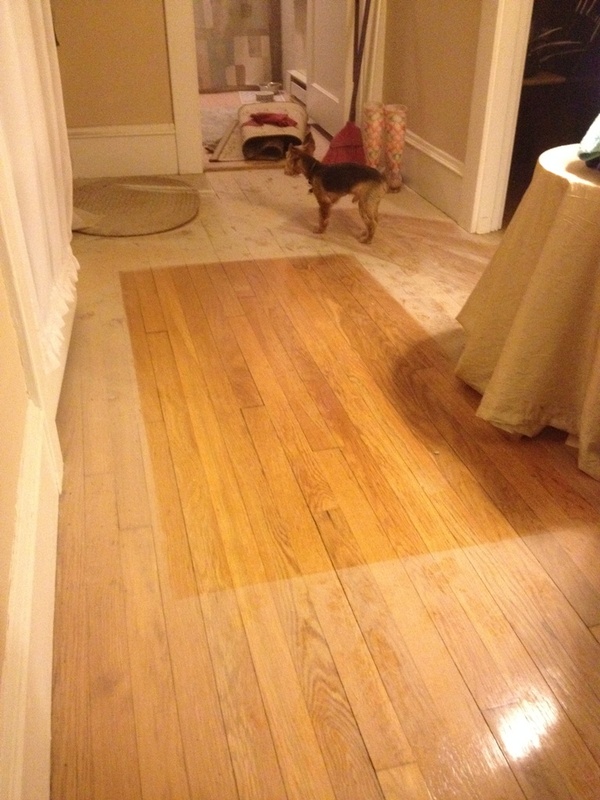 The dust + very snowy winter = constantly dirty hardwoods. I am looking for suggestions to get the ground in dirt/salt out and restore the shine. I’ve tried a few different concoctions, including one with a mix of vegetable oil and vinegar. It helps with the dirt but doesn’t restore the original shine. Okay, back to the kitchen. 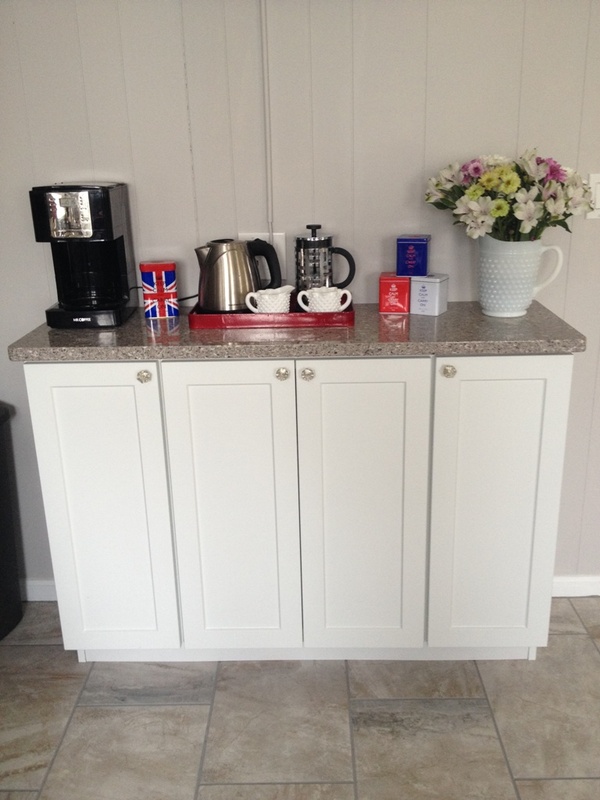 We had these awesome silestone counters installed in Alpina White. I love them. They compliment the backsplash and floors so well. We painted over the laminate wood paneling (see my tutorial from when we did it in the dining room here.) in Behr’s Gentle Rain. I loved the color so much that I painted our front entry and downstairs guest room the same color. 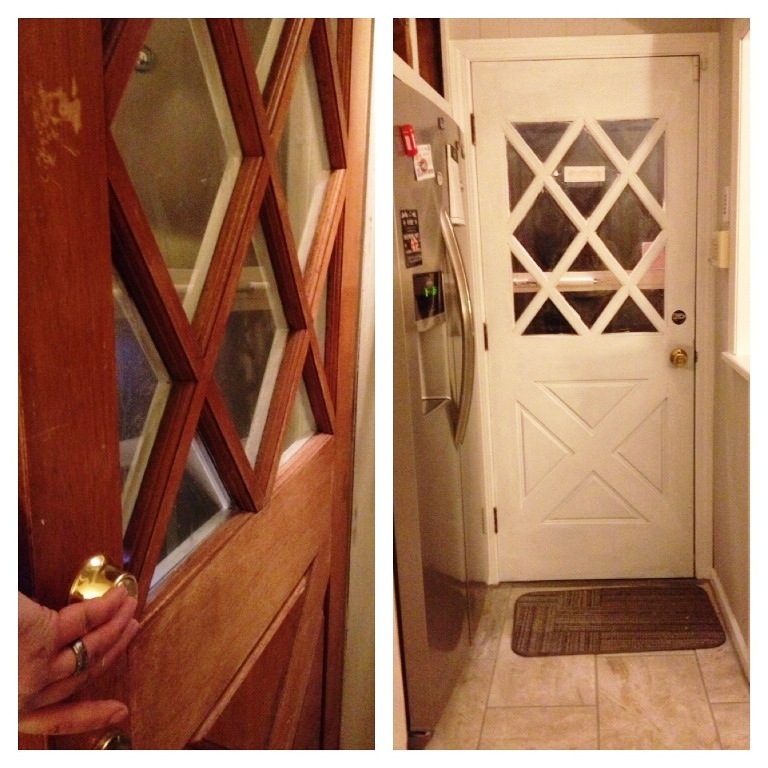 We gave all the trim and the back door a fresh coat of paint. Prior to our remodel, the kitchen was full of spindles. Blech. The night we closed, we made that our first order of business. It immediately opened up both the dining room and kitchen. After that, it was on to the demolition. 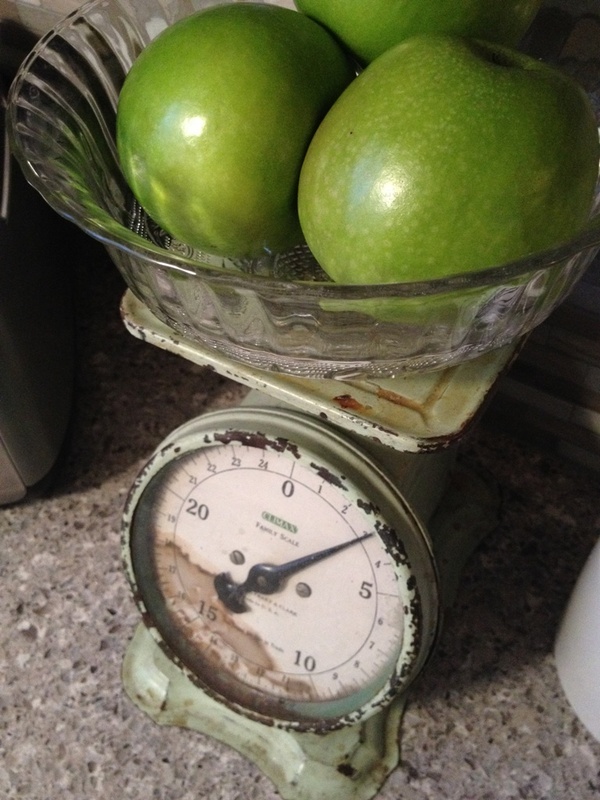 I found this vintage kitchen scale a few years back at a salvage/antique store for $15. Score! I never had a good spot to display it but I think it fits just perfectly here. This house has a lot of doors. There’s a French door to go upstairs. There’s another French door from the entry into the living room. We even found another one in the eaves. (We have no idea where it would have belonged originally but we plan to incorporate back into the house someday.) Even one of the entrances to the living room had a door! It was in the way more than anything so we decided to replace the old hollow veneer door (read: ugly) to the basement with that one. It ties into the space perfectly. I love the original glass knob. It’s a perfect compliment to the cabinet knobs. 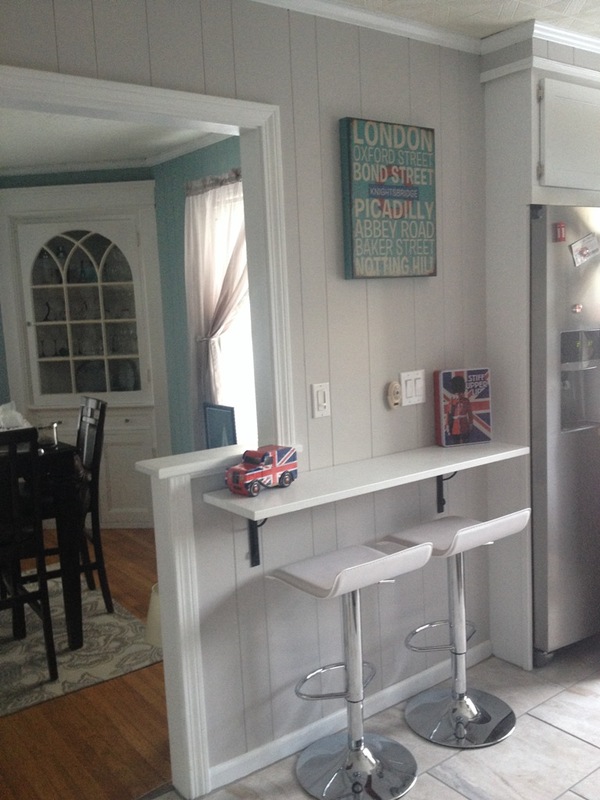 And since I may be the biggest Anglophile that’s ever lived, I had to have some British touches here and there. 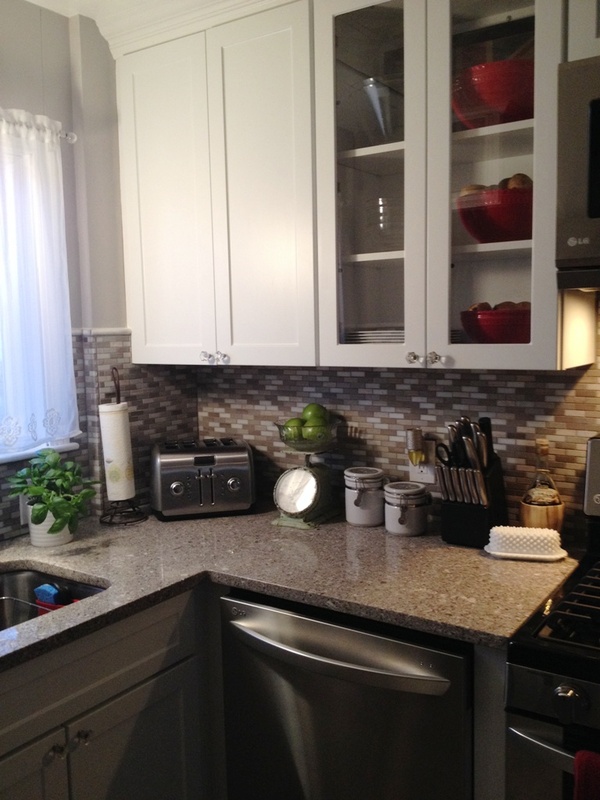 Can you tell me the name of the backsplash you used in the kitchen? I found a 10’x2′ slab of Alpina White Silestone at the Habitat for Humanity Restore for $180 so that was a tremendous score. 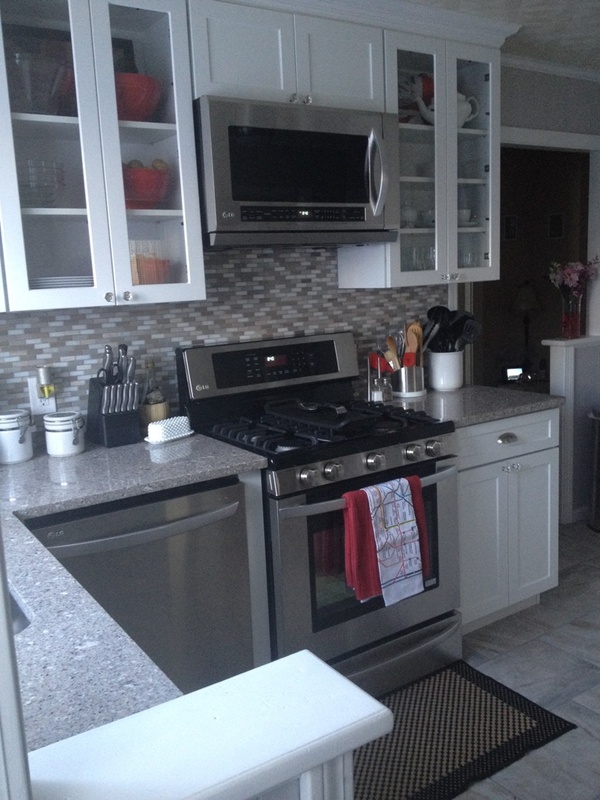 Allows me to also install new backsplash and I love your choice. Thanks so much!